I've been teaching American English in Hungary since September 2008. Chestnut puree, or gesztenyepüré in Hungarian, became a personal dessert favorite ever since introduction by my host teacher Trixi. Chestnut puree topped with whipped cream is the Hungarian equivalent of America's store-bought pumpkin pie: someone does all of the work for you all you have to do is cut it and top it with massive amounts of whipped cream. Cutting it really means grating it though, and one may whip their own cream. 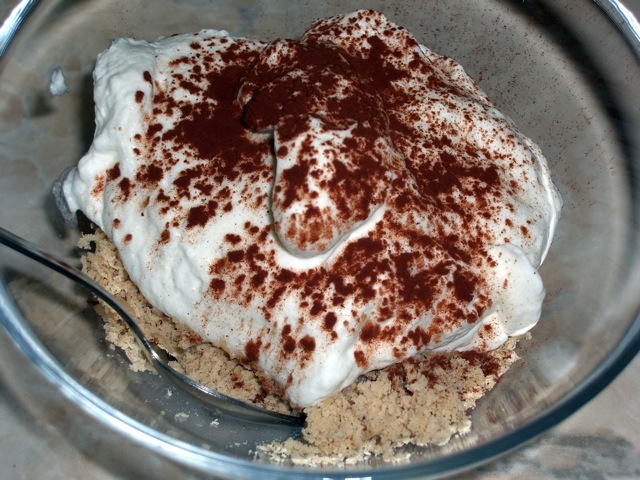 I mixed whipping cream and my homemade coconut cream to create coconut whipped cream then I dusted the grated gesztenyepüré and with cocoa powder. Nagyon finom!